Hampton Court Palace provides 500 years of royal history at the state apartments, 60 acres of riverside gardens and the world famous maze. Apart from the Palace itself and its gardens, other points of interest for visitors include the celebrated maze, the historic real tennis court (see below), and the huge grape vine, the largest in the world as of 2005. By car: The palace is located on the A308 and is well signposted from all the major local roads. From the M25 take either exit 10 on to the A307 or exit 12 on to the A308. The palace is also accessible via the A3 and then the A309. 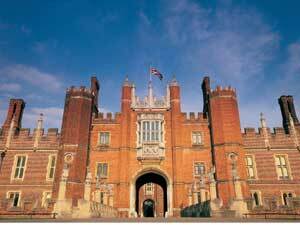 By train: South West Trains run services direct from London Waterloo to Hampton Court. The journey takes only 35 minutes and the palace is a 2-minute walk across the bridge from the station. By bus: Bus routes: 111, 216, 411, 451, 461, 718, R68, 416, 513, 267 (Summer Sundays only). By River boat: From Richmond or Kingston with Turk Launches (April - mid September) and from Westminster with Westminster Passenger Cruises (April - September).